The bracelet measures approximately 7" long with a total of 5 strands, which means the bracelet will fit a wrist that is 6" to 6-3/4" comfortably. We provide you with the absolute best quality of liquid silver out on the market today! Test it yourself and you'll know the difference! 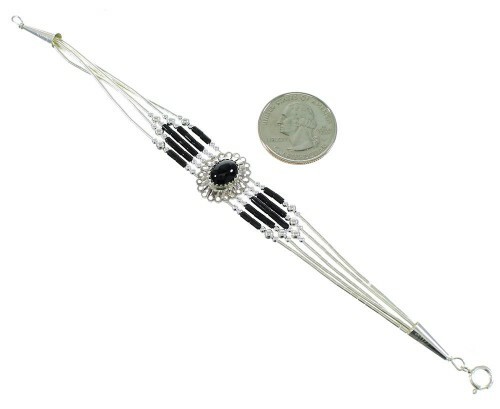 This stunning bracelet is hand strung bead by bead out of genuine sterling silver along with a real Onyx stone and man made Onyx beads. The stone is placed at the center of the bracelet in a hand cut serrated bezel setting. Imprinted work can be seen surrounding the stone creating a lovely concho design. The bracelet is made up of five strands that consist of a lovely combination of: liquid silver, 2-mm Onyx heishi beads, 2-mm silver rice beads, and 2-mm silver round beads. Each bracelet end is completed with a silver cone for a beautiful look. The cones are stamped sterling. Don't pass up this amazing bracelet!